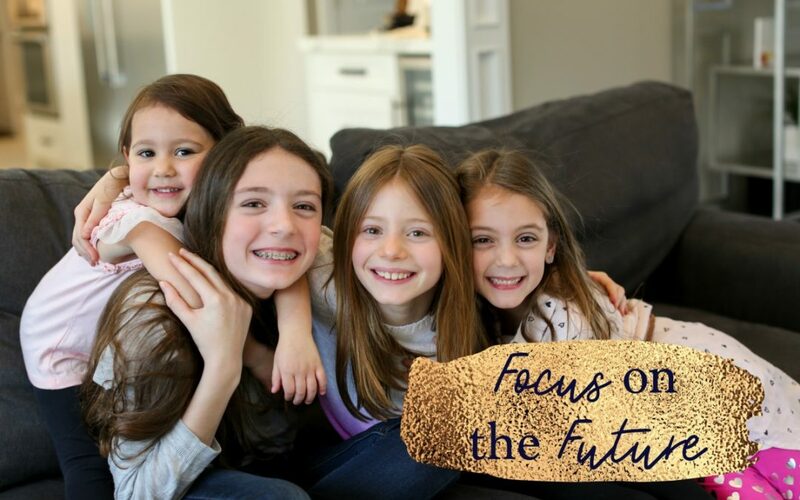 I talked recently about focusing on the future when it comes to our kids. I want to dig deeper into that topic to give you tips and examples you can start applying today. I want to help you think about what exactly you’re trying to achieve as you trudge through your parenting lows and soar through your parenting highs with your precious kids. Maybe all you’re trying to achieve right now is survival. If so, that’s nothing to be ashamed of! But I want MORE for you. Here’s a peek into one of the first things parents see in my parenting course. I give them an entire questionnaire that asks what kind of human being you want to produce. Meaning=when your children are adults, what kind of person do you want them to be? Why do I ask that question at the beginning of my course? It is our job to overcome those challenges for our kids’ benefit. In the middle of a parenting struggle, do you ever pause and reflect on why you’re about to decide the way you’re deciding? If you’re like most moms and dads, probably not. We make decisions for and about our kids so often throughout the day. Big ones and small ones. Since you’re taking the time to read this blog post, however, I’m going to assume you’re not in the middle of a struggle with your kids. Um…if you are, you can revisit this post later. Okay, so if I have all or even 70 percent of your attention, this is a great opportunity for you to reflect with me for a moment. The midst of a toddler tantrum is NOT a good time for you to get philosophical. Think about your answer to this question with me. I wrote my answer for you so you can see an example. Q – Why am I striving to be a good parent? • see the value of working hard to achieve those goals. When I am struggling through a challenge with my four daughters, I try to figure out what aspect of our current struggle could help them become those women that I want them to become. I use that to help me make my decisions. Now for a glimpse into my approach as a parent. How is this similar or different to yours? Are you still working yours out? • My husband and I are largely responsible for the types of adults our children become. • From the time that they’re babies, the choices that we make for our kids help them to develop the coping skills and the skills of independence and responsibility that they need in order to succeed in this world. • While we cannot guarantee the success of our children, we can feel good that we have done whatever we could to foster those skills of independence and responsibility and those qualities of kindness and manners that they need in order to be well-rounded individuals in the future. I coach parents to be consistent. Even as you go through the toddler years, it’s important to stick to your core beliefs and apply those beliefs to situations that arise with your kids. I talk to parents I mentor specifically about what motivates them and what their goals are. And I encourage you to find out what motivates you and then remind yourself of your motivation any time a parenting struggle occurs. Here’s an example that came up in my parenting course with a family and their toddler. A family I’m coaching has a 2-year-old daughter having a difficult time sleeping. (Anyone else in the same boat? This is common at age 2!) The parents acknowledged that they had a lot to do with the poor sleep habits their daughter had developed. It was important for us all to acknowledge their part and for the parents to know that I didn’t judge them harshly. The truth is that there are many things that we do as parents that affect our children’s behavior–good, bad and neutral. I firmly believe most of our children’s behaviors are reactions to our behaviors. Therefore, it’s up to us to change our behavior if we’re looking to change our children’s behavior. These parents told me they have a very hard time not giving into their toddler during bedtime. I told them to reflect on the real reason that they are trying to create better sleep habits. •Surface level / obvious answer: The child AND the parents need to sleep more…right now. How we teach our children to create certain habits today when they’re toddlers affects how they will behave in the future. So the next time you’re in the crossroads moment thinking “Do I give in on this or should I hold my ground?” I want you to remember the far-reaching effects. What areas do you and your kids struggle with the most? Drop me a comment below or email me at Sharon@Raiseology.com. And finally…Remember that being a better parent does not mean that you are eliminating the challenges you have in your home. Instead, being a good parent means that you are developing the tools that you need to face those challenges in the most productive way possible.